Tax collectors were not popular in Jesus day. People identified tax collectors with sinners. This career was associated with greed and left the poor struggling further financially. Tax collectors worked for the Roman Empire and were renowned for crippling people with these harsh taxes whilst taking a slice of the cake for themselves. 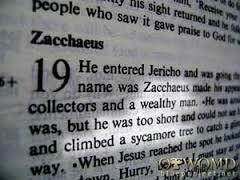 We are told from scripture that Zacchaeus was a small man in stature. 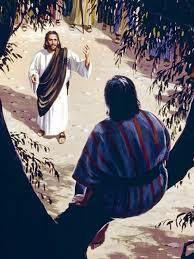 With his unpopular title as tax collector and being despised in society, I wonder if Zacchaeus felt very small inside too. In the Gospel of John, speaking about Jesus we hear “he came to his own, but his own did not accept him.” Jesus is revolutionary, reaching out in love to those that aren’t “popular” in society. That takes guts! Just like in today’s society, we too find it difficult to love the 21st century Zacchaeus in the form of city bankers with their big bonuses every year. Instead of pointing the finger or condemning these bankers for their corruption, is it possible that we too can change the hardened of hearts by reaching out in friendship? 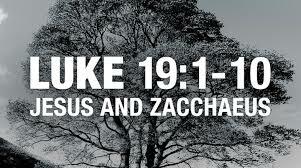 The key message in Luke’s Gospel shines out today as it surprisingly did to Zacchaeus too, in that there is no such thing as second class Christians in God’s kingdom! All are welcome. Zach must have been very well off, with a career and income like his! 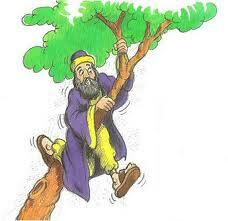 Yet with all this wealth and stature, he still climbed the tree to see Jesus. Why? This would suggest Zacchaeus was in the search for something his life wasn’t providing. and he does the same for us. seems, identified immediately with Zacchaeus, almost as though their friendship that had just been initiated at the tree lasted long before their first encounter with one another. 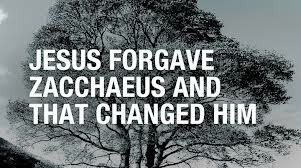 It is this undeserved love and acceptance that makes Zacchaeus move to a new way of living – living a full and happy life for God and his neighbour. Our lesson from this story is an encounter with Christ leads to transformation. Can you share this with one or two friends. Who are all the people in the story? What is the tension? Who am I in the story? Am I different characters at the same time? What is it saying to us? Can we share this with others? Your comments are welcome! For ‘Soul Food for Hungry Adult Communities’, on this same Gospel, click here. ← Soul Food for Hungry Adult Communities: Nov.3rd 2013: 31st Sunday in Ordinary Time, Year C.